Pomegranates fascinate me. I think it’s their vibrant color and their elusiveness. I will admit, the thought of de-seeding a pomegranate deters me from eating them often. This is indeed a shame as they are tasty and apparently very good for you. I managed to catch an episode of Martha Stewart over the Thanksgiving holiday in which she pleasantly showed us all how to “easily” and cleanly do the de-seeding. While her method of scoring, breaking open, and banging out the seeds over a bowl did direct most of the juice into one area and not all over the counter, it was still time consuming and I was quickly bored after getting through 3 or so of them. Still, what else are you going to do! After toying with the idea of making a pomegranate filling, I opted to just mix the seeds in the cupcake batter. I actually liked the way this turned out. The seeds didn’t really affect the taste of the batter, but they retained their integrity. So when you bit into the seeds, they were all juicy and flavorful. The one thing I will note is that I couldn’t really taste the grapefruit. The cake part was very delicious, but not grapefruity. This could be good or bad, depending on how you feel about grapefruit. Next time around I would double the zest and see how that turns out. I might also flavor the cream cheese frosting with some zest and juice, but that is up to you. 4. Whisk together flour, baking powder, baking soda, and salt in a bowl. 5. Measure out milk and grapefruit juice together. Add zest. 7. Add about one third the milk/juice mixture and beat until combined. 9. Mix in pomegranate seeds. 10. Scoop into cupcake papers about half to two-thirds full (depending on whether you want flat or domed cupcakes). 11. Bake for 22-25 minutes until a cake tester comes out clean. Note: These cupcakes tend to rise quite a bit and will overflow if you put too much batter in the cupcake paper. Keep it under two-thirds full. 1. Bring pomegranate seeds, water, sugar, and butter to a boil over moderately high heat, stirring occasionally. 2. Reduce heat to low and simmer, covered, stirring occasionally, about 10 minutes. 3. Transfer about half the mixture into a blender and carefully blend for 2 minutes. Transfer to a bowl then blend remaining. 4. Force the blended mixture through a medium-mesh sieve back into same pot, pressing on solids with back of a spoon. Throw away the solids. 5. Put an empty plate in freezer to chill. 6. Bring mixture to a boil over high heat and add pectin. Reduce heat to low and cook, stirring frequently, until it starts to thicken, about 45 minutes. 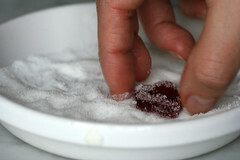 To test, remove from heat, then drop a teaspoonful on the chilled plate and chill in the freezer for 1 minute. Tilt plate the plate. The mixture should remain in a firm mound and not run. If mixture runs, continue cooking and stirring and repeat the test every 5 minutes. 7. Remove from the heat and immediately pour mixture into a pan lined with plastic wrap. Gently tap the pan to eliminate any air bubbles. 8. Cool to room temperature, at least 1 hour, then cover surface directly with plastic wrap and chill until firm, at least 2 hours and up to 1 week. 9. Remove from the pan and cut into desired shapes. Toss shapes in granulated sugar. 2. Top with a jelly. your cupcakes looks heavenly and perfect for the holidays. I love the idea of cutting out shapes of jellies to top cupcakes. Nice recipe idea! The little jellies are beautiful. Oh, that jelly looks to die for! Look forward to playing with this flavor combo. maybe I’ll add some grapefruit essential oil to perk it. I have pomegranite seeds in my freezer from when I bought an abundance of them on sale. Now I can make these cupcakes and see how they turn out. They look yummy. Thanks. You are so creative! The jellies looked soooo yummy! Those look so tasty, I’ll have to try them. 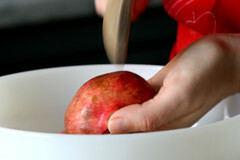 Fill a bowl with water, score and halve or quarter the fruit and submerge it in the bowl, working the seeds off. The seeds will sink to the bottom and the bitter pithy part will float to the top. Years ago I learned an easy way to remove the seeds from pomegranites. Fill a large tub, or your clean sink, with water. 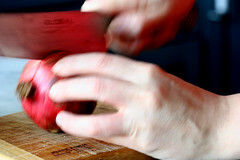 Break open the pomegranite under the water and tear it apart. The seeds will sink and the debris will float. Easy to scoop out the shell and pith and then retrieve the seeds (especially from a tub which can be drained). When my mom was a little girl, growing up in Brooklyn, she and her friends would stop by the fruit store on their way home from lunch. They’d buy a pomegranate from the fruit man who opened it for them, and they would all share the seeds on their way back to school. She said they were always in trouble with the sisters for their faces and uniforms being stained in red. Aside from that, I only yesterday found your site. Your pictures are beautiful, but even more, these recipes are to die for. I am thrilled! Oh my. I’m drooling. The combination of pomegranate and grapefruit sounds divine. I need to try this out ASAP. BTW, I usually extract the seeds by hand. There’s something therapeutic about it for me. I’ve gotten pretty fast at it. My friend and I thought these sounded amazing so we tried our hands at them. They are, in fact, wonderful tasting and pretty easy to make (we are VERY unexperienced bakers). Deseeding the pomegranates did leave my white kitchen counters looking like a bloody masacre though. Oh, one thing, the acutal cake part turned a very strange color. Almost blue, almost green, almost gray. Is that right? I am really looking forward to trying this recipe as I love pomegranates. Thank you so much. 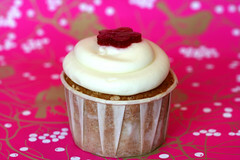 I did a pomegranate cupcake too for my blog. I used pom molasses instead of using the seeds, and made a tangerine mascarpone frosting. I love those jellies, what genius! I never would have though of that, nor the grapfruit! Bravo indeed! I tried your recipe yesterday while at work – thank you so much. I doubled the zest and got a lasting grapefruit “tang” on my tongue. I wonder if that was the case with the others? I had to use raspberries instread of pomegranates due to being – literally! – one day late for them at the grocery. First off, I just discovered this blog but it makes me VERY excited. I *love* cupcakes! You are a cupcake GENIUS. I miss when pomegranites were cheap because people thought they were weird and didn’t know how healthy and yummy they were. Sigh. They’re getting hard to afford these days. But I was also going to suggest that you use some grapefruit oil next time since you said they weren’t grapefruity enough. I find the oil’s where all the real flavour in citrus is. Fantastic – I adore Pomegranates at Xmas time – a big bowl of them grace the table. Usually I only squeeze them over slow-cooked lamb – but CUPCAKES – WOW! Can’t wait to try this recipe. Thanks again – I get so excited now when the email comes through that you have updated. Inspired me to start my own blog – fun! hi there! I just recently discovered your blog and I must say: I love it! I made these pomegranata cupcakes yesterday and they are soooo delicious! to keep our chef coats from becoming saturated in pomegranite juice, we cut them open and deseed them in a bowl full of water…. the the white membrane floats slightly, and those gorgeous seeds stay perfectly intact with out ANY mess. Thanks for the recipes! Whoo! I made these cupcakes last week and they were SUCH a hit with my mom. (She generally doesn’t like to eat what’s around, but she broke down when she saw pomegrantes being used.) Since the batter amount was so large and I took in note of your zest usage, I added two teaspoons more of the grapefruit zest (bringing it to 4 teaspoons) and it had a delicious citrusy taste. Also, I increased the amount of pomegranate seeds by a full cup (after doing a test batch of the 2/3s cup). I definitely think that an increased amount of citrus helps the flavor really come together. Thanks for this recipe! I have a tip for you re: seeding pomegranates. Score it, then, with a medium size bowl of water, submerge, break open, and go to with your fingers. Added bonus is the bad ones and the white interior pith float to the top. Then, just drain. A great addition to any cream cheese frosting is fresh or dessicated grated coconut. You can just dip the tops in a plate of coconut. 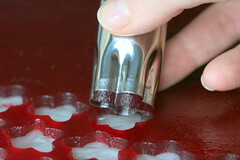 This is ideal for travelling cakes since saran wrap won’t stick to the frosting if it is covered in coconut. Perfect for a child’s lunch box. Tastes lovely with carrot cake as well as vanilla or chocolate cupcakes. And you are super genius !!! And especially loved the pomegranate jelly! I would really like to know if you can make orange jelly or mango jelly or strawberry jelly using the same proportions in your recipe? 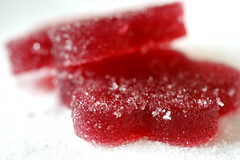 I am not an experienced cook, so would love it if you could write some approximate proportions of how to make different flavored jellies? PRETTY PLEASE with Cream cheese frosting on top!! I hope you read this and answer my question,Thanks!!! Last night I was feeling inspired and tried a quick bread version of your pomegranate-grapefruit cupcake. I double the zest, pom seeds and increased the grapefruit juice. Sour cream and vanilla rounded out the liquid. Dry ingredients stade the same except for an increase in the baking powder. Your love of experimentation has got me in it’s grip. Thank you. You rock! we always use grapefruit on our dessert and this is a fruit that is full of antioxidants too..*.